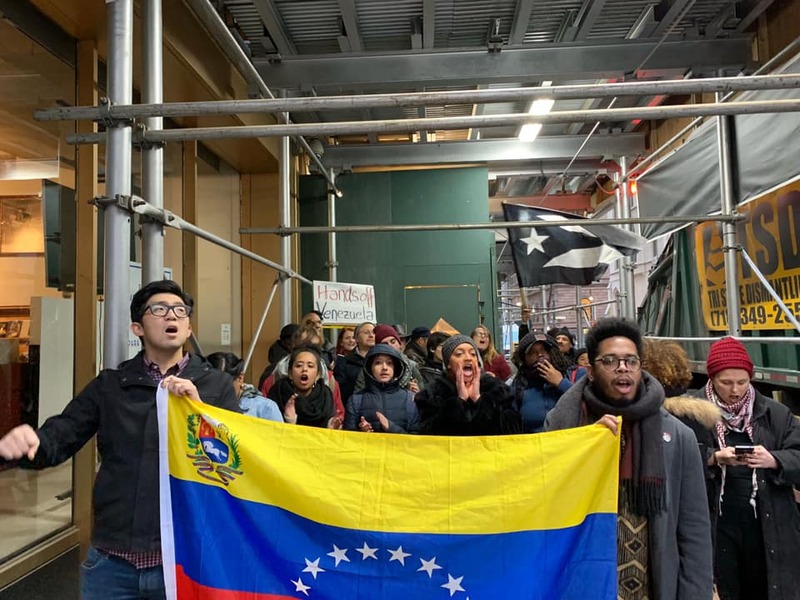 Reacting to these developments, members from various social organisations and movements in New York City who oppose the US attempts of intervention in Venezuela and support democratically elected president Nicolás Maduro immediately organised a picket in front of the consular building. They blocked the building’s entrance to prevent more opposition supporters from entering. “We found out that the Venezuelan opposition had occupied the consulate and we decided to do a picket out front. We went first with a group of 10-12 people and later we brought together a bigger group from different social organizations and movements in the city. We realized that the opposition had gotten inside of the consulate, they had already taken down the poster of Chávez, they had moved the figure of Bolívar and they had put a sign out front that said, “the Consulate will re-open to attend all of the Venezuelans that want to return” [to Venezuela from the US],” explained Manolo de los Santos from Popular Education Project and People’s Forum, two of the organisations participating in the picket. “They were organizing some type of celebration inside of the consulate with champagne and who knows what else. It was there that we intervened and we blocked the entrance to the Consulate. Many upper-class Venezuelans who are part of the opposition began to arrive to celebrate that the opposition had occupied the consulate. However, we were there for around three hours blocking the entrance and they were unable to enter. They had to move or cancel the party that they had organized,” de los Santos described. Chanting “Hands off Venezuela!” and “Chávez lives, the struggle continues!”, the protestors in NYC will continue to be vigilant and keep check on the developments in the coming days. “We ruined their party today, but we are remaining alert to see what will happen in the next few days,” de los Santos said.